As most people who know me (or regular blogTO readers) can attest to, my love for dim sum ( and reviewing dim sum eateries ) is bigger than me. Some days, I could just have it for breakfast, lunch and dinner. 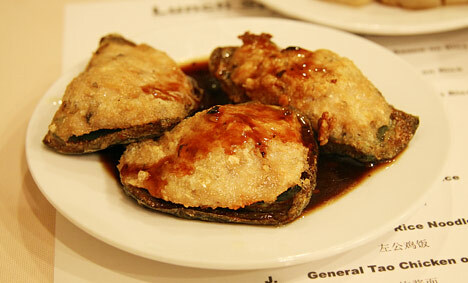 So then, when a reader suggested that I try out Kowloon Dim Sum Restaurant on Baldwin Street, I was excited. I mean, they've got dim sum in their name-- that has to be a good sign, right? Perhaps I just built it up too high, or maybe they fare better in the morning, but when I dropped by Kowloon for their all-day dim sum one evening, I had to wonder why they bothered offering it. Beautiful, generously portioned, and well presented. These are the words I'd use to describe the food upon arrival. Those are the words that came to mind after I'd dug in. Pictured at the top: Sticky Rice with Leaf . This lotus wrapped sticky rice was huge. My friends and I just sat staring, wide-eyed, as it was set down before us. One of our favourite dishes, I was excited that there was more than enough to share. We sliced into it to find it stuffed generously with ground meat and what appeared be slices of pork. The pork was dark red/pink on the edges and dark brown in the middle. Perhaps it was preserved meat, but I didn't like the look of it. The ground rest seemed good, but once someone spooned some onto their dish we found that the centre of the this dish was all cold. Thankfully the wait staff was friendly and really helpful. We sent it back to be warmed up (for the 2nd time obviously) and moved on to other dishes. Stuffed Green Peppers : One of the better dishes, it was warm (woohoo) and actually quite tasty. The peppers were a little dry but the flavour was all there. 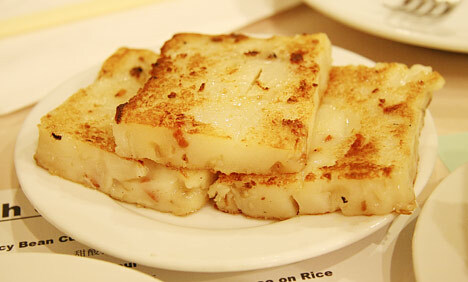 Turnip Cake : I usually go for pan-friend turnip cake instead of taro cake because it's softer, milder flavoured and usually prepared in a way that leaves it less fishy tasting (you probably have to have tried it to know what I mean). Kowloon's had a nice consistency with added bits of chinese sausage in there, but tasted more like a taro cake (especially in the fishiness dept). It was okay, but I wasn't grabbing seconds. 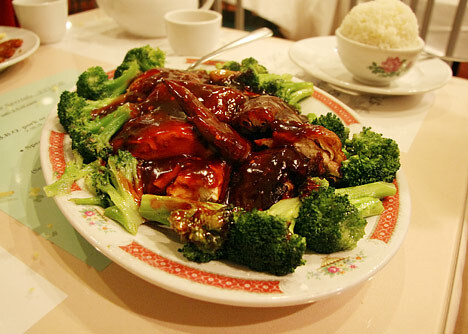 From the regular menu, we picked out Kowloon's "specialty", the Peking Duck. This dish was so saucy it was hard to not drop pieces with our plastic chopsticks, but it was actually quite good. The meat was wonderfully tender and the broccoli steamed nicely. Most agreed they'd order this one again. And in terms of dessert, we weren't up for anything much else, but got a order of Sponge Cake . 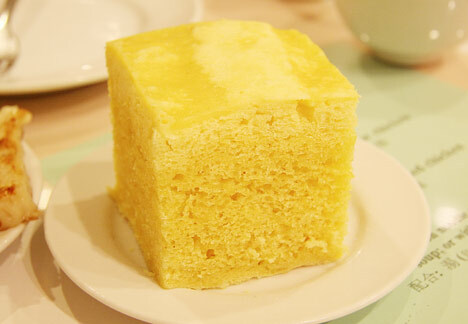 Now, while I learned to cook within a set of culinary traditions that see sponge cake as an ingredient, not a main dish, I do love myself a nice block o' steamed sponge cake at dim sum. That said, not this sponge cake. Dry, dry, dry! We didn't/couldn't even eat it because it crumbled at the touch of a chopstick. I understand that this was perhaps made fresh in the morning, and am not asking for miracles, but if you can't serve up some kind of palatable dish, then simply take if off the "all day" menu... simple as that. In terms of budget, dim sum prices start at $2.40 and certain $2.40 dishes are boosted to $3.40 in off-hours, so they should at least be cooked, somewhat fresh, and edible. If back, I'll be sticking to the dinner offerings at this dim sum place.